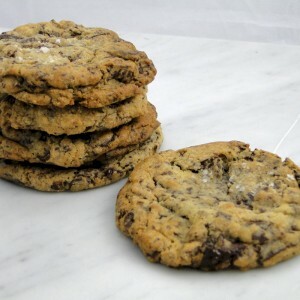 Recipes for Jacques Torres chocolate chip cookies have been published all over the internet. They have been published by the New York Times, Martha Stewart, and umpteen food bloggers. But here's the deal. Jacques Torres cookies are incredible and not like any other chocolate chip cookie you have ever eaten. Sooo... just in case you missed them, here they are again. 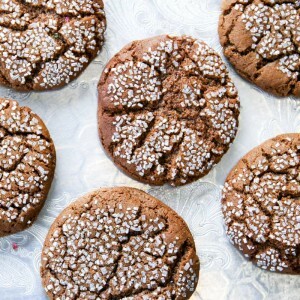 Besides it is almost Valentine's Day and baking these cookies is a definite show of love. These are not chocolate chip cookies you make on a tight budget. There is over $20 of chocolate in one batch of 25 cookies. That's right, almost a dollar a cookie in chocolate alone. We use semi-sweet or bittersweet Scharffen Berger chocolate. Alternatively, you can purchase quarter size chocolate disks or fèves from Jacques Torres if you want to stay true to his recipe. There is an incredible amount of chocolate in this recipe, almost 1 1/4 pounds to be exact. The volume of chocolate actually exceeds the volume of cookie dough. Your cookie will come out slightly differently depending on how big you shard the chocolate. The above pictures come from two different batches. One batch with larger shards, up to 3/4," and one batch with smaller shards, up to 1/2." You will get bigger gooey smears of chocolate with bigger shards. Creaming the butter, sugar and eggs for 10 to 12 minutes. We actually cream the butter and sugar a bit longer than the original recipe, just because we are big on creaming. Aging the dough for 24 to 36 hours in the refrigerator before baking. 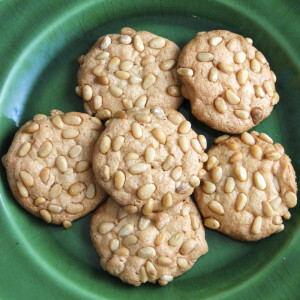 See my blog post for three tips to making great cookies. The original recipe calls for two types of flour: bread flour and cake flour. Bread flour is a coarse, high gluten flour (13-14%) that produces a chewier product. Cake flour is a fine, low gluten flour (7-9%) that is used to make tender pastry. We wanted to simplify the recipe a bit so we use a combination of cake and all-purpose flour, which has is 12% gluten. I can't recommend silpat liners enough for baking cookies. 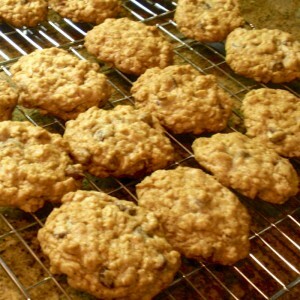 They prevent cookies from sticking to the pan and encourage even browning. You will find lots of uses for your silpat other than cookies. Nothing sticks to silpat so they are great for rolling out pie dough and kneading bread. My daughter Margo introduced me to these incredible cookies and these are her instructions. Thank you Margo! These extraordinary chocolate chip cookies are in a class by themselves. My daughter says they shouldn't even be called cookies they are so good. Adapted from Jacques Torres recipe. Mix flours, baking soda, baking powder and salt together in a bowl. Set aside. Using a large chef's knife chop the chocolate into 1/4" to 3/4" pieces. See pictures for example. Larger shards will result in bigger gooier smears of chocolate. If you have one, use a stand mixer with a paddle attachment. On medium-high speed, cream together the butter and sugars for 5 minutes. Add eggs and vanilla. Mix for another 5 minutes, occasionally scraping down the sides of the bowl. Butter is creamed when it is light and fluffy, has expanded in volume and is pale yellow in color. Reduce mixer speed to low and add dry ingredients and mix just until combined. This will take less than a minute. Turn off mixer and gently hand stir in chocolate. Using a 1/4-cup measure, scoop out 25 balls of dough. Lay a piece of plastic wrap over the cookies and press down to minimize contact with the air. Cover tightly with a second piece of plastic wrap. Refrigerate 24 to 72 hours. When ready to bake, heat oven to 325 degrees if using a convection oven, or 350 degrees if using a conventional oven. Cover a 13 x 18" baking sheet in parchment or a silpat and arrange 6 balls of dough on the sheet. Sprinkle a pinch of Maldon salt on the top of each cookie. Bake 7 minutes and rotate the cookie sheets so the cookies bake evenly. Bake another 7 minutes and check. The cookie tops should be golden brown, but still soft. If they are not done after 14 minutes, add baking time one minute at a time. Do not over cook. Let the cookies cool on the baking sheet for 10 minutes then transfer to a wire rack to finish cooling. Amazing cookie! This is now my go-to recipe when I want to gift my kids or friends with cookies. The recipe and tips are worth following closely because the outcome is a no-fail superior chocolate chip cookie. Scharfen Berger chocolate is pricey-over twenty dollars worth in this recipe-but it is delicious. I make the cookies half the size called for. These earned me the name “cookie goddess”! I love that title and am so glad you enjoyed the cookies. I agree they are amazing. My family says these cookies are so good they shouldn’t be categorized as just a cookie, that they are really in a category by themselves. Smaller is a good idea. How long do you cook the smaller cookies in case someone else wants to reduce their cookie size. How interesting. I am intrigued that almond or ground oatmeal works well. Did you use the same measurements? What a great idea for a gluten free cookie!